Hi, Thank you, friends and viewers. 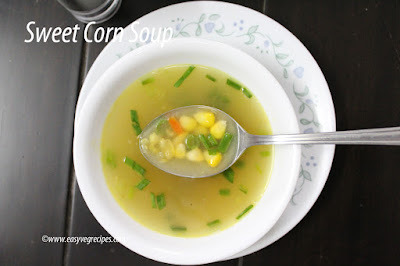 Today I will post how to make sweet corn soup recipe. "To feel safe and warm on a cold wet night, all you really need a soup" -- Laurie Colwin. Warm and satiating soups are always liked by all on chilly evenings. It not only satiates our taste buds but also improves digestion. I like home made soups always. My most favourite soups in this season are tomato soup and carrot soup. I am bored of them now, so trying new recipes from my old cookbooks and from different recipe blogs. Grind 1 tablespoon of corn kernel into coarse paste. Heat butter in a thick bottomed vessel, add chopped garlic and saute it. Add in chopped carrots, french beans and spring onion whites. Saute them for a minute. Add grinded corn paste and saute it also for less than a minute. Add in corn kernels and pour in water or vegetable stock. Vegetable stock is always tastes good. For vegetable stock recipe link is given in the ingredients list. Add salt and bring this to a rolling boil on a medium flame. Simmer the flame and add pepper powder. Let it boil for a minute. Drop in spring onion greens and let them boil. Add corn flour in water and mix it well to make slurry without lumps. Slowly while stirring the soup, pour in the corn starch into it. Check the consistency and taste. Decorate it with a spoonfull of chopped spring onion greens. Enjoy!! hot sweet corn soup on a cold wet night. 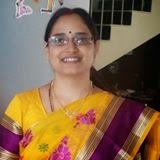 Thank you for visiting my blog. Hope you liked all my recipes, feedback and comments are welcomed. For more soup recipes click here. Feel free to contact me through mail: sailajaangara@gmail.com OR eat@easyvegrecipes.com Or Can whatsapp me any time +91 99667 00045.